I pulled out my Pinterest Cookin' Mama Board when I needed a last minute side dish for last night's dinner and decided to try this Quinoa Broccoli Casserole from Eating Well, Living Thin Blog. My husband and I loved it, the kids were confused and only tasted a bite. I changed a few ingredients, and used cream of mushroom soup, so my casserole turned out a little gray in color and was not as appetizing as Linda's lovely photo. In a large bowl combine the soup, mayonnaise, milk, shredded cheese, sugar, and pepper until well mixed. Stir in the quinoa and broccoli. Spoon mixture into prepared 8x8 shallow casserole dish. 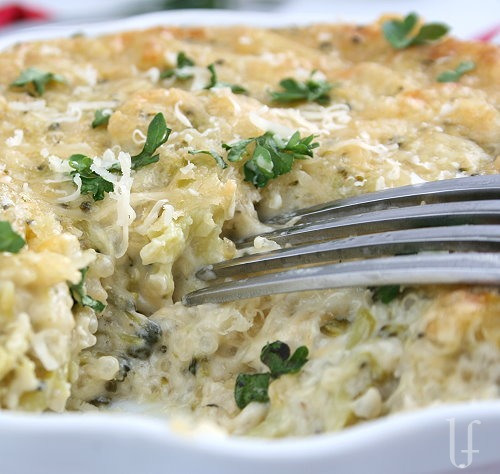 Sprinkle on a couple tablespoons of Parmesan and bake for 35-40 minutes or until bubbly on the edges and golden. Makes 8 generous 1/2-cup servings. This is worth a try - Pinterest Pass! Sounds like broccoli cheese casserole - what's not to love? My kids would be the same way, tho. They still won't try couscous, tho I have made it lots by now and swoon over it every time. I soooooo can't wait to try this!! Thanks for sharing!